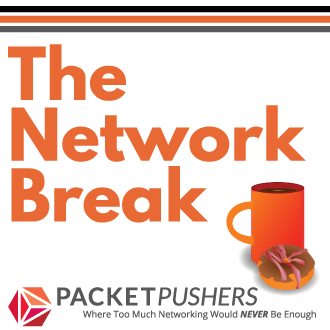 Recently, Dave at DavesBlog made some rather startling observations that Verizon is throttling Netflix traffic, backed up by a comment from some low level help desk staffer that this is true. Taking a casual comment as “truth” is wildly unreasonable. On the Internet, it is very hard to pick the difference between Net Neutrality and Net Reality. 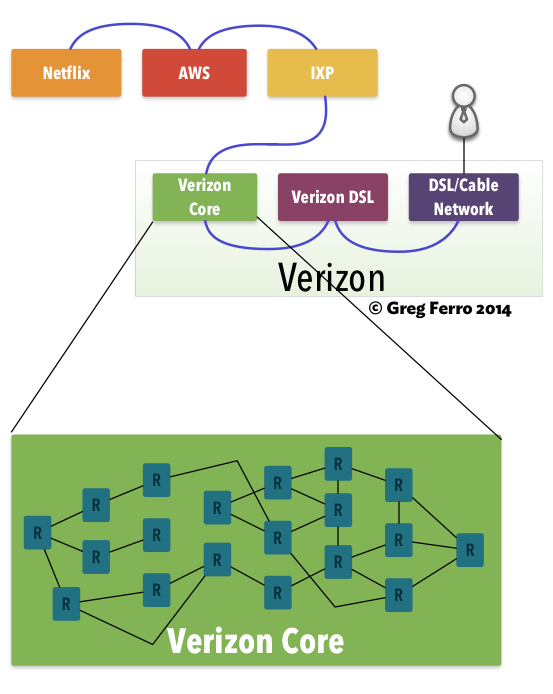 Lets consider a rough outline of the network path from Netflix servers to your home. In simple terms there are six networks which are owned by different people all of which can impact the performance at a given instant in time. Point 1: Netflix is responsible for the logical network and performance of its own system. If Netflix is not able to provision enough servers to deliver the content then performance will be poor. Netflix rents server on an hourly basis from Amazon. At any time, there may not be enough servers. And customers have no ways to know. Point 2: Amazon is having growing pains. In recent AWS conferences it was indicated that they are desperately working on new methods to increase bandwidth and power to their data centres because there isn’t enough fibre or local infrastructure. At peak times, Amazon could “run out” or exceed of available capacity. Amazon does not guarantee bandwidth and heavily oversubscribed what bandwidth they have. Point 3: Data centres have special areas where all the carriers connect to Amazon known as Internet Exchange Points (IXPs). These sub-networks are shared responsibility between Amazon and the Carriers. These networks are also oversold and oversubscribed. 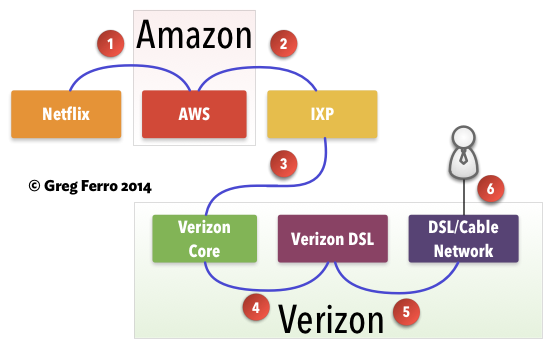 Point 4: The IXP is connected to the Verizon national backbone. 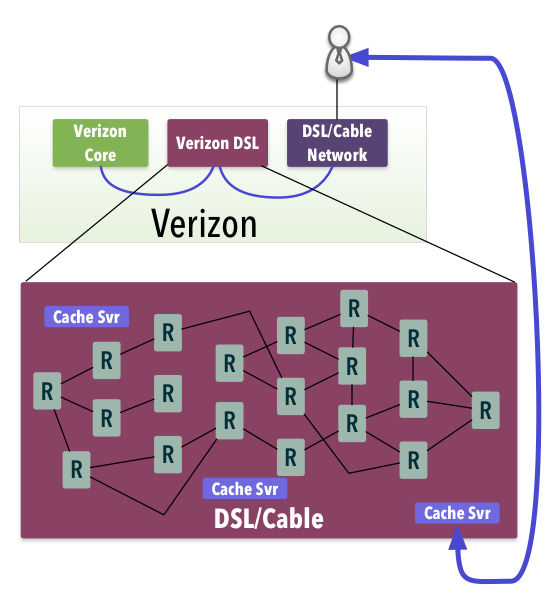 The connection between the IXP and Verizon is the most likely point of failure in this scenario because of excessive load at peak times. Point 5: The Verizon DSL network that connects to a person’s home is even more heavily oversold. Typically on ratios of 200:1 and up to 400:1 by some companies. That means that your 10Megabit home connection with 10 Megabits of bandwidth is shared with at least 200 people in your geographic area. If a significant number of those people in your suburb or ten to twenty-mile radius are using a lot of bandwidth, such as watching Netflix, then your shared bandwidth can be impacted. Point 6: Your own DSL connection is very slow. And shared with other people in your house. Ok. So now tell me where the performance problem is ? Having highlighted a fairly simple description of the six different owners of delivering a TV show to your computer, lets consider what happens inside the boxes. A typical carrier core network consists of hundreds of network devices. Each is connected to another one across the geography of a country. Any one of these devices or connections can be oversubscribed at any time. At peak time, these devices are often under stress and carrying close to capacity. In capitalism, unused capacity is a profit lost so the carriers have little incentive to grow their networks ahead of customer demand. 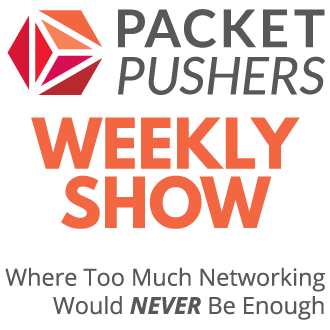 Bandwidth always lags customer demand. The most egregious technical failure here is the nature of the so-called test. When you perform a trace route you are tracing the path to the server with a given IP Address. But your video/TV/movie does not come from the same path, it comes from somewhere completely different. This is a highly simplified look at an Internet pathway. Occams Razor says that the among competing hypothesis the simplest hypothesis should be selected. I judge it much more likely that Amazon has run out of capacity at peak times than Verizon is performing throttling. If Amazon is growing constantly (as we are constantly told) how can it possibly keep up ? There are plenty of instances of AWS slowdowns over the years. It could be Verizon of course. And they could be throttling traffic because of oversubscription at peak times. But even IF Verizon is throttling traffic somewhere in the network, proving this as intentional policy is very hard in a system that is massively oversubscribed at any point. It would require a government-led inquiry to uncover that sort of deception at an institutional level. On the Internet, it is very hard to pick the difference between Net Neutrality and Net Reality. If video doesn’t come from AWS, why do you think AWS capacity issues would cause video problems? Greg’s points are all or almost all still valid, regardless of whether AWS is the cache/CDN or something else is. Even if there is a significant CDN infrastructure, the idea of “many users are traversing a complex infrastructure to reach shared and oversubscribed content” a.k.a “Net Reality” is important. The Cache server would still need a source to cache from, which is AWS. What’s being said is that while AWS does not directly handle every request, it still needs to be able to handle the requests from the ISP cache sites. That can lead to possible slowdowns if you request data that hasn’t been cached yet, while other data may seem to be faster (eg stuttering halfway through a movie if other users haven’t gotten there yet, or stopped watching for the night). Netflix offered to provide a number of caching servers at appropriate locatons to alleviate peering congestion, Verizon refused. End of story. Your article does give some insight though.